The Cardinal (Aaron Allshouse) gets his comeuppance, and Bosola (John Clark) won’t be far behind in GreenStage’s The Duchess of Malfi. GreenStage photo by Ken Holmes. 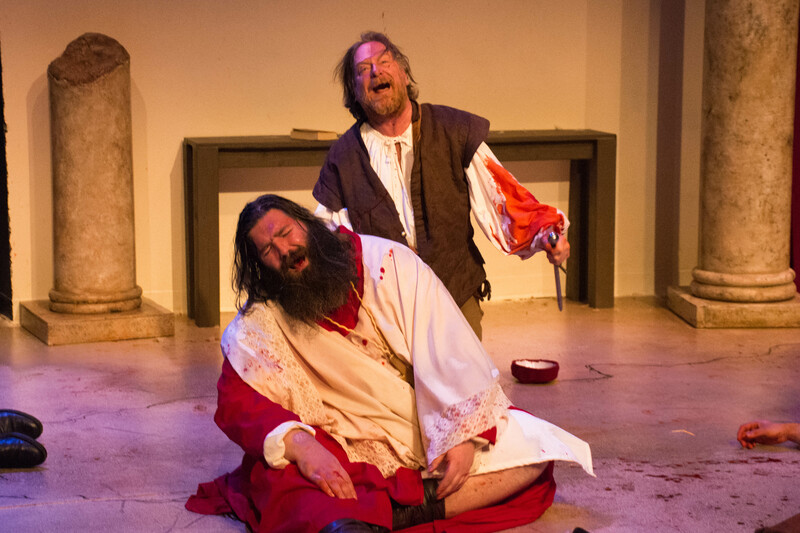 Sure and begorrah, this is the final weekend for our Hard Bard production of The Duchess of Malfi, starting with a special performance this evening, when we will turn St. Pat’s Day into St. SPLAT’s Day! Watch for the pot o’ gold. The carnage continues with shows Friday and Saturday evenings. FREE tickets here. We have just three performances remaining! Don’t miss the show, playing at Stage One at North Seattle College. Tickets for the St. Pat’s Day show at the door, available online for future performances. Always free; donations joyfully accepted! Go see a play; there will be blood!